Fans of K-pop girl group BLACKPINK can move to the beat this December with exciting news by Shopee Malaysia as the band comes to Malaysia for its first-ever concert on 23 February 2019 at Malawati Indoor Stadium, Shah Alam. Besides Kuala Lumpur, the BLACKPINK 2019 World Tour titled “In Your Area”, organised by MacpiePro, will also include Bangkok, Jakarta, Hong Kong, Manila, Singapore and Taipei. BLACKPINK members Jennie, Rosé, Jisoo and Lisa will be performing their famous hits including Ddu-Du Ddu-Du, which peaked at No.55 on the US Billboard Hot 100 in June 2018. The girls also set a record when the music video for that single hit 300 million views in 69 days, making them the fastest K-pop act to do so. With the growing K-pop culture influence here in Malaysia, it is no surprise that many K-pop stars have made household names among Malaysians including BLACKPINK. It gets even better as the band is also Shopee’s regional brand ambassador, giving Shopee users one step closer to watching their favourite girls on stage. Tickets to the Malaysian leg of the world tour will be available for purchase on Shopee 12.12 Birthday Sale on 12 December 2018 from 12 noon onwards, at a 10% discount. This is only applicable for the Blink Zone ticket (original price at RM 693). With the Blink Zone tickets, fans can watch the BLACKPINK members up close as it is just right in front of the stage. Tickets to all three shows including an additional show in Bangkok have been sold out, according to the group’s official Facebook page. So BLACKPINK fans better grab theirs before the tickets run out on Shopee! Just head to the YG Entertainment Official Store at Shopee to secure a chance of a lifetime. Shopee is giving fans another reason to get their hands on the concert tickets. All they need to do is pay RM5 for a RM12 off voucher, making it a further RM12 savings on top of the 10% that they will get to enjoy when they purchase the ticket. The RM12 off voucher will be available for sale on Shopee from 8 December 2018 to 11 December 2018, 11.59pm. It is limited to one voucher per customer. Since the Blink Zone tickets on the YG Entertainment store are limited in quantity, do take note that purchasing the discount voucher may not guarantee a concert ticket, so do act fast on 12.12! 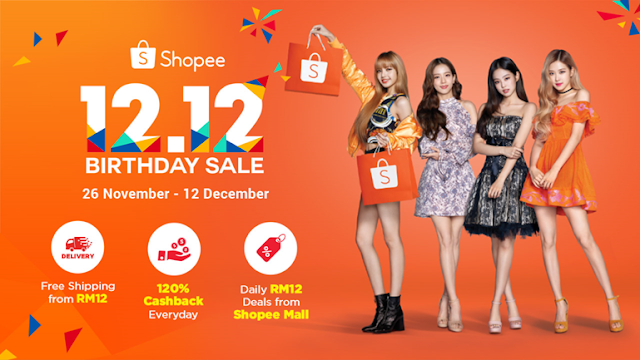 To celebrate the Shopee 12.12 Birthday Sale in style and grandeur, Shopee is giving away flight tickets to Korea for two people as well as exclusive signed BLACKPINK CDs through its BLACKPINK Watch, Wish and Win Contest. As the name suggests, the mechanics of this contest is simple. All you need to do is watch the Shopee BLACKPINK TV commercial on Facebook (with the BLACKPINK Ddu-Du Ddu-Du Shopee version), share the video and tag a friend, and wish Shopee “Happy Birthday” in the most creative way. Contest ends on 10 December 2018 on 11.59pm. To find out if you are the winner, watch Facebook Live on 11 December 2018 at 11.00pm. Visit https://shopee.com.my/m/blackpink for more information.